Your actions say a lot about you... I was listening to the radio as I prepared to come to church this morning and heard a report on the radio about an Orthodox Jewish couple, who are suing their neighbours because they are effectively housebound for 25 hours once a week, as the automatic lights that come on when they open the door to their apartment, infringe Sabbath laws. Surely this is the sort of simple dispute that could and should be rectified through talking... Like I said, your actions say a lot about you. What did the actions in the boat of Jesus say about who he is? 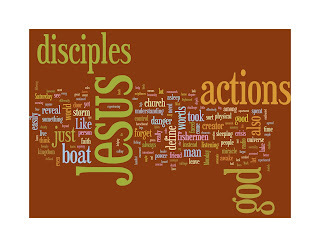 What did the actions of the disciples say about who they are? How Jesus can sleep through a storm is beyond me! I have reasonable sea legs, but sleeping a in what would have been a smallish fishing vessel seems a little unlikely. We also need to remember that amongst the dispels were some experienced fishermen so they would have handled all sorts of weather out on the lake before - they were concerned for their safety and that of the boat so it must have been very rough. They wake Jesus and instead of helping steer the boat, or maybe even bail it out, instead he commands the winds and the waves to stop and they obey - this sort of mastery of the elements is something that only a god could do - who is this man? Prior to this event, the disciples had been experiencing the profoundest mystery - Jesus the teacher, Jesus the healer, Jesus the miracle worker - whilst a man, Jesus also clearly possesses something of the creator God about him. It strikes me that the disciples had every right to be frightened whether Jesus was awake or asleep! The disciples needed Jesus when faced with danger and the limits of their mortality. They, like so many people cry out to God in Jesus, when in danger. They recognised that the only person or thing that could save them was God. Once awake and all is calm, Jesus asks the disciples - where is your faith? Did they really think that God would let them and Jesus die like this? Did they really think that this was it? Even though God was with them, agreed asleep, in fear of their lives they forgot that he was there and they assumed that they were alone. Your actions define who you are. Jesus’ actions and words reveal him to be the friend of fishermen, but also creator of the universe with power to control the physical world for good and the will of God. The disciples’ actions and words reveal their lack of understanding of the great love story of God and humanity running from the moment of creation and reaching it’s high point in Jesus. Their actions and words also reveal a very real understanding that the only person who can help them when confronted with danger, uncertainty and ultimately death is God himself in Jesus. The disciples took this man who is God just as he was into the storm and their actions defined who they were in terms of their faith, and his actions revealed that there was more to him that met the eye. But they took him out just as he was nonetheless. Our continued challenge is to do one better than those disciples - to look at this man and nevertheless see God on Sunday and take him out ‘just as he was’ with into a world filled with storms. We need to trust that he is with us always and his kingdom is among us, so when we are faced with crisis we let our actions as disciples define who we are. Amen. The image above is the sermon as a Wordle - interesting to see which words are used the most and helpful perhaps to see the text as a visual... Enjoy!